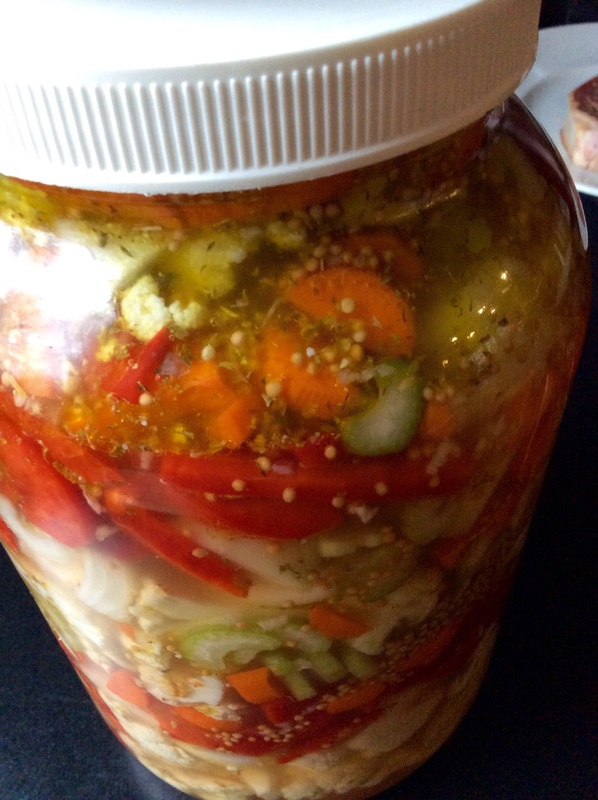 Whether it’s the Italian Giardiniera or the French spelling of Jardiniere, it’s a delicious mix of vegetables that get their kick from soaking in a vinegar-mustard seed brine. My Mom used to make Chow-Chow, which is similar, using vinegar and yellow mustard. Either way, I love the taste of this veggie medley that really has no rules: use whatever your favorite vegetables are, brine them, and enjoy. I got carried away and used a gallon-sized glass jar for this recipe, perhaps far too much for most applications. This recipe has been reduced to fit a quart-size Mason jar. In a non-reactive saucepan, bring the vinegar, sugar and salt to a boil, just until all the ingredients have dissolved. Remove from heat and let it cool to room temperature. 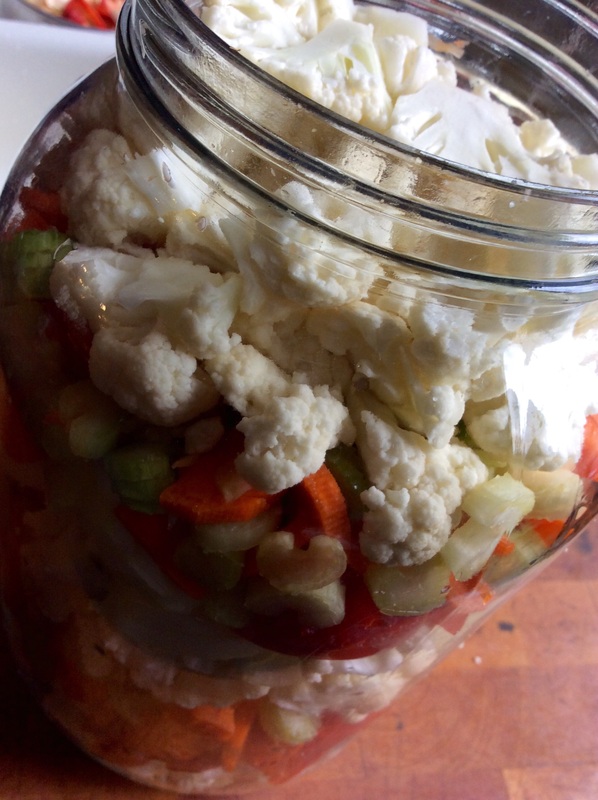 Chop the cauliflower, onion, pepper, celery and carrot, placing them into the Mason jar. Feel free to use more of what you love and less of what you don’t! Once the vinegar mixture has cooled, add the garlic, mustard seeds and oregano to the mixture and stir to combine. Pour this mixture into the Mason jar of veggies, seal the jar and shake the jar to thoroughly mix everything. Store in the fridge. It’ll be ready to eat in a couple of days…if you can wait that long! NEED A FAST-GROWING VINE? TRY HOPS!